Usually there is a guest speaker along with practical demonstrations and workshops. The Mid North Coast Branch of the ABA is a new club and has members resident from Grafton to Macksville. Recent meetings have had over 30 people in attendance. 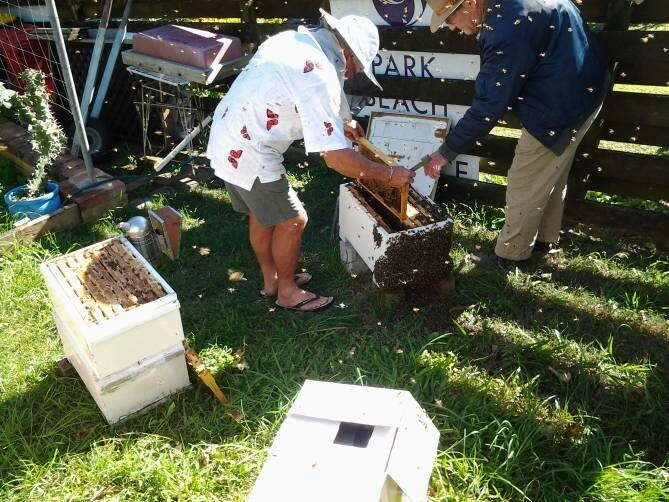 The club has a mix of members varying from very experienced beekeepers through to those who are new to the beekeeping. Meetings are held at different locations across the area covered by the club. Often the meetings are at members properties. Usually there is a guest speaker along with practical demonstrations and workshops. Morning tea and a luncheon are organised by the club. People new to beekeeping are particularly welcome and will be well supported by the group. Grevillea, Red Cedar, Bottle Brush, Native Frangipani, Jacaranda, Lilli Pilli, White Mahogany. Weeds - privet, flatweed, fireweed, thistle, clover. Lord Howe Island sits in the middle of the Tasman Sea and is a remnant of a massive volcanic ridge. The Island is home to many endemic species of plants, birds and marine life. Much of the vegetation on the Island is found nowhere else in the world. The Island is home to a vibrant European honey bee population. We don’t know how they got here, but it’s likely they were introduced by the early settlers. We took 1 frame of brood up to the super and replaced it with one frame of foundation. The rest of the super was filled with 7 frames of foundation and left for them to go back to work. 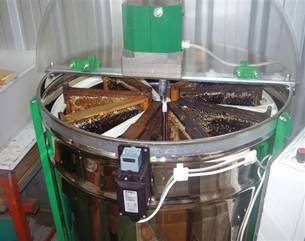 Of the 30 grafts that Glenn introduced into the hive twenty four hours previously, twenty cells had been accepted and started which is a fair percentage considering the poor conditions being experienced. It was a beautiful day as has every day been lately, gosh we could do with some rain! It is a bit risky to requeen at this time of year, because of low food sources. But at Sharif’s, the bees were bringing in plenty of pollen, presumably from the clover in the grass, the Billygoat weed (purple flower), Fireweed (yellow flower), and banana flowers in the background. The hives were in a nice sunny spot on top of a hill. There seemed to be no sign of winter. Flow hives were painted by the students in the Arts class. A year 10 student designed the label. Power blackout, no gas? - no problems - cook some snags on the solar wax melter! In this region Swamp Mahogany (Eucalyptus Robusta) is starting to flower in April and may continue to August. The bark is rough, fibrous and greyish brown. The leaves are shiny on top and dull underneath with a leathery texture. The honey has a pleasant taste and is dark amber in colour. The honey is good for winter stores or spring build-up in dry weather. Light creamy pollen is also produced. Bee hives need not be disturbed during the colder months. Provided they are well prepared they will survive until Spring. Check the queen to see that she is performing well. If she is failing kill her and unite the colony with another healthy one above a sheet of newspaper. Check all brood combs for disease, particularly AFB. By now you should have extracted some delicious honey. What are you going to do with it? Keep enough for yourself and give some to family and friends. Give a jar of honey to your neighbours to sweeten them up so they won’t complain about your bees. There are many different techniques for rearing queen cells. When you are aware of how they work you can choose the best method to suit you and your local conditions. A queenless hive can often be detected by unsettled behaviour and a louder buzzing of the bees. On closer examination large stores of pollen coated with a shiny layer of honey will generally be found. Brood is absent. Dwindling numbers mean the hive will most likely die out.